Report #5 – The Last Push | Falco Sigh! Wow. I had no idea someone was working on this, where were you a few weeks ago? I have a DualShock 3 and I wasted many hours on the internet finding a way for it to work well on Linux. The goal was to play Super Meat Boy and Bastion on Linux with a controller. The solution I found was to use a program called “xboxdrv”. It creates a virtual joystick device that’s recognized by programs as an Xbox 360 controller, and all the DualShock 3 buttons are mapped appropriately. So with that program I was able to play both games perfectly (using USB only; I have the controller synched to a PS3 so I didn’t want to deal with Bluetooth). Also worth noting is that these particular games only support the Xbox 360 controller, so the driver was very useful. Anyway, I hope this helps. You can find xboxdrv here: http://pingus.seul.org/~grumbel/xboxdrv/xboxdrv.html. It’s also packaged in Debian/Ubuntu and available in Arch’s AUR. 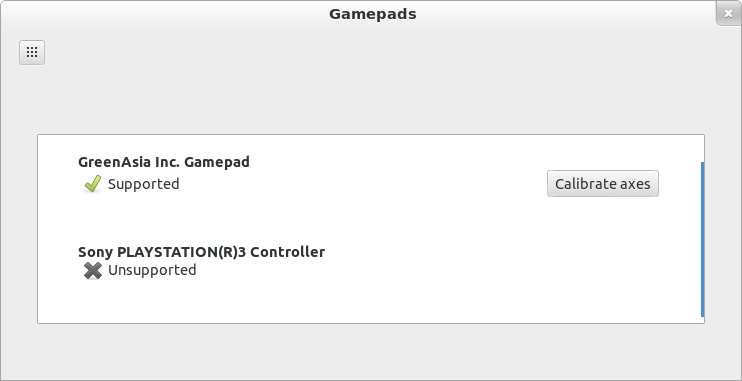 The PS3 gamepad (Dualshock 3) needs to be paired with the computer (using the USB cable) before it can be used through bluetooth. The Wii gamepad needs a driver, I used wminput. 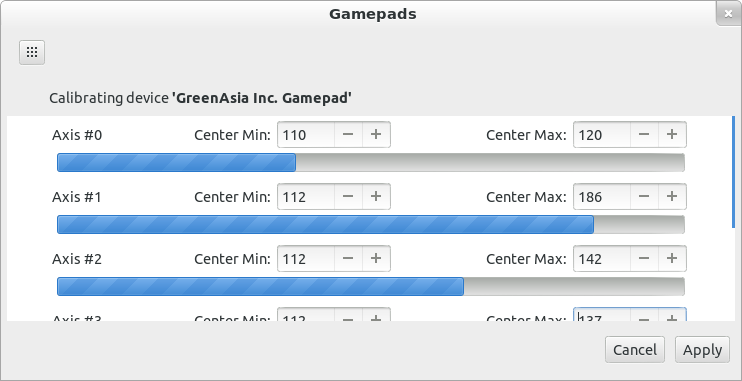 Those are areas where a Gnome utility would really be useful. By the way, joydev is completely deprecated now, and evdev should be used instead. I see no point in supporting joydev these days. Evdev is a superset of the deprecated joydev API. * The analog sticks should be handled quite well (ABS_X, ABS_Y, ABS_HAT0X, ABS_HAT0Y). * The analog triggers are more complicated, but I guess I would map them on ABS_HAT1Y and ABS_HAT2Y). * The standard buttons are easy (BTN_START, BTN_SELECT, BTN_MODE, BTN_THUMBL, BTN_THUMBR). * The accelerometer should use ABS_RX/RY/RZ for rotation, translation is more problematic since the only logical thing would be to use ABS_X/Y/Z, but it’s already used for the main control, and applications don’t expect an accelerometer there anyway. * Last but not least, the pressure-sensitive buttons are a lot more problematic, each button is acting like an absolute axis. Most programs don’t expect to receive absolute axis values for buttons, only a pressed/released information. The good thing would be to send the simple button press information as well as the pressure information as an axis, except that we don’t have any way to do that (I guess that ABS_PRESSURE is a global device attribute and not specific to the event being sent). – we should have an extension for pressure-sensitive buttons, maybe something a little similar to multi-touch and/or ABS_PRESSURE. – If we don’t have that, then the good thing would be to not export those features and just have the standard buttons and sticks. Note that accelerometer support would allow to support the wiimote as well. “With maturing support for the PS3 joystick in BlueZ and the Linux kernel, we hope that most people will no longer need this package unless they want to use the gyroscope and accelerometer axes”. I do not know if the documentation and code there may be helpful for you, but for sure people in the project will be happy with the improvements in the device support.